It’s not easy to pray and, therefore, people have those prayer wheels, rosaries and carpets that facilitate the praying act in a physical, mechanical way, without engaging the mind and the heart too much. In our culture we are, however, used to praying to someone, to have an illusion of contact with the Person that is ‘listening’ and reacting in some way. It’s most difficult to pray to God, so we prefer to resort to praying to the saint and the blessed whose mediation abilities have been confirmed by the Vatican, a 44-hectare church state (a fact I recently learnt from Manuela Gretkowska). They are led by Mary, the Mother of Jesus, the only person physically present in the Heavens, who – by Polish civil servants of lower ranks – is often abbreviated to the BVM (the Blessed Virgin Mary) since street signs are not wide enough to house the full name. Apart from that She is the patron saint of a Toruń radio station, which recently has made the attitudes towards Her in our country at least ambivalent. It has not always been like that, however, as Witold Wirpsza in his book from the late 1960’s entitled Pole, Who Are You? writes that as a nation we are governed by two female and, to a certain extent, competing deities – the Black Madonna of Częstochowa and Our Lady of the Gate of Dawn. Being an invocation to them both, the beginning of our national epic (translator’s note: Sir Thaddeus, or the Last Lithuanian Foray ) is evidence of this. The authentic picture of Mary has never been preserved (or it has never even been created), but when contacting Her, we gladly resort to symbolic representations (sometimes confirmed by mystic visions). These are paintings and sculptures, the former often gaining the status of ‘miraculous’ and are mass-copied (a copy of the Black Madonna of Częstochowa signed by one of the primates is travelling around Poland, accompanied by notebooks full of more and more bizarre prayers added in the Chinese-whispers-like manner). The latter – put in domestic altars and shrines – are handy ‘daily necessities’, usually showing a slim woman of timeless beauty, wearing a blue robe and bare-footedly trampling on the serpent (Lucifer, the fallen angel). One can buy them in church bazaars and devotional articles stores. Sometimes they also take the form of small plastic bottles with removable crowns (Mary is also the Queen of Poland, beside Anna Jagiellon and St. Jadwiga). Having unscrewed the crown, one may drink some holy water since Mary, the Mother of Jesus, willingly reveals herself in the vicinity of healing springs, thus taking the plenipotentiary powers of the ancient Naiads, who – on the other hand – give Her as good as they get, as there is at least one confirmed case of miraculous healing after listening to The Source of Arethusa by Karol Szymanowski. The reason I am mentioning this is that the home sculptures will be of special interest to us here. 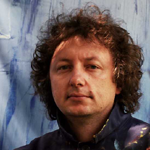 Andrzej Kuczok is a painter, a blogger and the creator of the monumental mosaics in his hometown of Chorzów. His son, Wojciech, in the screenplay to Pręgi – in order to ridicule him and to release his own childhood traumas – orders him (or, to be more precise, orders the father played by Jan Frycz) to cover gypsum figurines of Mary, the Mother of Jesus, with paint. Undoubtedly, painting such figurines requires some artistic skills. Yet, such an activity has nothing to do with artistry, and, thus, it may be recognised as pseudo-artistic hackwork – unoriginal, ‘mass-produced’ and supporting thoughtless and typically Polish bigotry and inclination for kitsch. I remembered that son’s gesture when I saw a few new works by Jacek Łydżba, a Czestochowa-based artist that lives in ‘the shadow of the basilica’ and treats it pretty seriously, not like a Nightmare, but as a Challenge. Łydżba, who is famous for his slightly religiously-marked easel paintings, had created a series of paintings portraying the architectural motifs of the sanctuary of the Black Madonna and then decided to reach even deeper, to the source of ‘primitive’ religiousness, using for that purpose mass-produced, gypsum figurines of Madonna (I am using this word fully aware of its ambiguity nowadays, since it’s also a stage name of a famous singer). By creating his one-off (one of a kind) polychromes with such repeatable material, the painter seems to be asking quite an important question: in what aesthetic atmosphere do we grow up (and often remain till the very end) as Polish Catholics? Are these the masterpieces of Cimabue, Giotto and Donatello? Well, rather not. Frankly speaking, I had a copy of a lovely, girly-Madonna by Leonardo – hanging over my cot, but it was exceptional (my dad, like Kurczok’s father, is a local artist). Usually we remember an angel-shaped money-box where you were supposed to put change just before your religion class, or a rather tasteless roadside shrine of Mary, the Mother of Jesus, in front of which, in May, people used to sing about a girl called Bernadka who went to the woods to collect timber (only to come across Mary at the famous spring). Łydżba’s polychromes are not of a transgressive character. There is no desire to violate tradition or even to engage in polemics with it. They do, however, introduce a sentimental quality – they are not meant to mock, but to move, and their reflexivity is gentle and restores dignity to the figurine that is actually mass-produced and made only for money, but it is still a representation of Mary, the Mother of Jesus. Mary’s garment may be flowery, starry or decorated with hearts (which sometimes bleed). Łydżba does not introduce new motifs – he merely multiplies the old ones with some ‘baroque’ exaggeration. His Mother of God does not even refer to the tradition of the Beautiful Madonnas. Instead she is ‘pretty’ the same way Czesław Miłosz described her in his Theological Tract . At this point we can ask another question: can (or should) a first grade aesthetic experience be accompanied by a deep religious experience? Well, not really (again). Despite the fact that the patronage of the Church led to the creation of numerous masterpieces, our religious imagination is based on paltry representations and cheap chromolithographs through which (due to the complete erasure of individual features) shines the Truth. It’ not art that redeems us, but faith. And kitsch has a wider influence than the masterpiece paintings and the frescos of atheistic Renaissance masters – beauty and prettiness clash and contradict the same way as perfectness of pornographic choreography and tender cuddling up do. It could be said that in the works of Jacek Łydżba, the Mother of God can see Herself better than in the paintings for which some Italian prostitutes posed. We cannot, however, forget the fact that such works are mainly of camp use, because they will not result in prayer, but laughter or even chuckle, and one would find them in the houses of ‘modern art’ enthusiasts. I am sorry for these paintings and, at the same time, I feel grateful to them for being free of any hasty, superficial dreadfulness that I expected. They are good and arouse trust – they are not works of art. Naturally there are more questions. Does the term ‘mass culture’ refer only to the songs of the above-mentioned singer, Madonna? Did Pope John Paul II really promote high culture when he showed his knowledge of silly highlander songs? It’s been a long time since camp artists, and especially Ronald Firbank, discovered a discrepancy between ‘church’ aesthetics and the principles of good taste. It seems to be a flaw of Łydżba’s works that they are tasteful, look so good and their naturalness brings to mind the grace of exotic fishes placed in the same tank with preposterous veiltails that are a weird result of some genetic manipulations. Humanity leads us to artificiality, religiousness involves the need for a ritual and chasuble, which help conceal the horror of death and are natural in that sense. A figurine of Mary, the Mother of Jesus, does not ridicule those who worship Her. It’s just a synonym of ‘fallen’ art that helps to get around Kant’s sublime the same way as prostitution allows us to circumvent the Socratic idea of ‘love’ and, at the same time, to satisfy wants. A life without ‘higher’ feelings is possible and actually quite common, so if we are imagining Madonna in a robe dotted with Black swastikas, it’s only because we have already got out of Her caring embrace and we are getting cold, so we need something to warm us up.